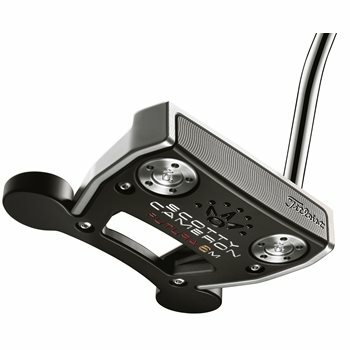 The new Titleist Scotty Cameron Futura putter family melds the best design characteristics of the previous generations to bring you a lineup of tour-proven shapes and configurations with enhanced stability and forgiveness, improved alignment features, and responsive feel and feedback. The Futura putters feature multi-material technology for enhanced High-MOI performance and to increase stability and forgiveness. The vibration dampening system produces soft but responsive feel and feedback while the heel-and-toe weighting removable weights are perfectly matched to shaft length to ensuring consistent balance, feel and forgiveness at any length. The Futura 6M offers the ultimate in forgiveness and resistance to twisting on off-center strikes.